This is our second Thanksgiving stay at your most beautiful cabin.Thank you for hosting. We hope that we are able to return next Thanksgiving and become regulars. Can't wait to come back. Our family spent Thanksgiving here. Cabin is lovely and the views are breathtaking. We had a blast. Just perfect for our three generations ages 3 to 90. First Polar Express for us all! Hope to be back next year. We loved the cabin in the mountains! Very clean and the great supply of amenities was amazing. Thank you for everything. We had a great time. Hiking up the mountains, gem mining and went to Gatlinburg. We had a great time. Loved the Cabin. Had a great time and hope to stay again next year. The team has always been very friendly and knowledgable. The team at Great Smokys Cabin Rentals are very polite and professional. They were dedicated to making our vacation an enjoyable, memorable experience. I have come to trust their cabin descriptions to be exactly as shown on their website - and I have not been disappointed. 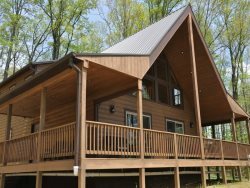 They are our "go-to" cabin rental when we visit the Smoky Mountains. Five stars *****. Nestled in a gated community at the top of the mountain this cabin has it all. Beautiful views, gas fireplace, & every necessity you may need. We truly enjoyed our stay. Exceptionally clean. We loved your cabin. It is located in a beautiful area. It is easy access to many fun adventurous. Thanks for the wonderful memories. We Loved your cabin. It is located in a beautiful area. It is close to many fun adventures. Thanks for the wonderful memories.